When I moved to my farm in December it was cold and often snowy. I had no idea what kinds of plants there might be. The former owner bought the place sight unseen a few years before and had never been there, so no one could tell me what I would find. Now that spring has finally hit the mountains of Western North Carolina, I’m finding all sorts of things, including yarrow. Yarrow, or Achillea millefolium, has been used for centuries. Early use dates back to the Romans and Achilles, the warrior, who used it on his troops. It’s said that he gave it to them to give them strength and to aid in recovery of their wounds. Later it was used for many other things. Yarrow is antimicrobial. Achilles may have been on to something when he used yarrow on the wounds of his soldiers. It has an antimicrobial action that can kill germs. It has long been used as a wound wash.
Yarrow helps to relieve pain. It contains compounds that can help to alleviate minor pain. It has been chewed by Native Americans to relieve tooth pain. Yarrow induces sweating. It can help combat colds and flu by helping the body to sweat out toxins. One old time recipe calls for yarrow, peppermint and elderflower. I would also add ginger to the mix to increase sweating. Yarrow helps circulation. It can also help to strengthen blood vessels and veins, possibly helping varicose veins. It can also help circulation by moving congested blood. By moving congested blood, it can also help to tone the liver. Many ailments can start in the liver. You can read more about it here. Yarrow helps with digestion. When used in a tea along with chamomile, yarrow can improve stomach distress like gas, bloating and colic. Yarrow is a great women’s herb. It can help with many problems of the reproductive system. Cramps and other menstrual complaints can be alleviated by drinking yarrow tea. An oil infusion can also be made from dried yarrow and a carrier oil such as sweet almond or grapeseed oil. Read about how to make an oil infusion here. Yarrow can help with the urinary tract. It makes a great tea that will balance the pH in the urinary tract, which can cause discomfort. Dried yarrow can also be made into a sitz bath that can be used to soak in when suffering from a urinary tract infection. It can help alleviate pain and itching. Yarrow is a good skin problem solver. For minor skin irritations, use yarrow tea on a cotton ball. It can help heal acne, stop the itching of bug bites and cool down sunburn. The antimicrobial action helps with many skin problems. Yarrow is a great landscape plant. It is drought tolerant and comes in a great variety of colors. It can adapt to many soil conditions. Yarrow is a great bee and butterfly plant. Bees, especially honey bees, really love it, as do many butterflies and moths. Where do you find yarrow? You can always grow your own or wild harvest yarrow if it’s found in your area. If it’s not, you can buy organic yarrow leaf and flower here for a very reasonable price. Use it to make your teas, infusions, baths, and other preparations as mentioned in this article. Yarrow is great for so many things, but you’ll want to avoid it during pregnancy. The same compounds that help with menstruation can cause complications if you are pregnant. You’ll want to avoid using yarrow if you are on medications for blood clotting. Yarrow tends to thin the blood and it may interact with blood clotting medications. 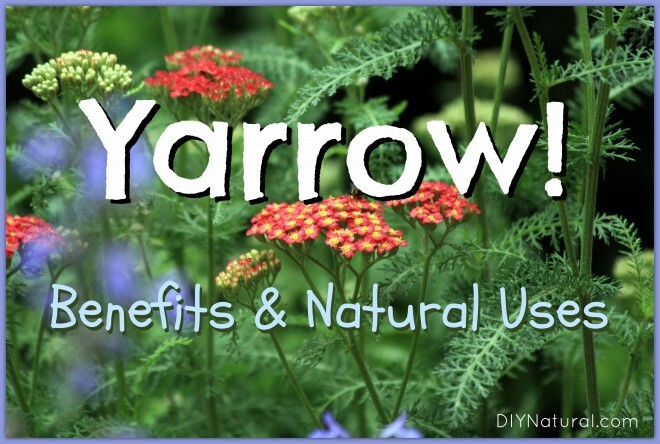 Have you ever used yarrow? If so, tell us about it! My son is very susceptible to poison ivy irritations. One year it was quite awful. i brewed a tea from my white garden yarrow which he applied with cotton onto his legs. It stopped the weeping and helped the itching calm down. I’m glad you mentioned this Sue. I’ve been working on a solution for poison ivy that was mostly jewelweed, but this year I was planning on including yarrow for the same benefits that you listed. It would probably work for bug bites as well. Thanks for bringing this up Terry. I just saw the video on Giant Hogweed. I didn’t even know about it until just a few days ago. Yes, be absolutely sure of what you are picking. To be sure, seek the advice of an experienced herbalist or buy from a reputable source sure as your local food co-op. Is it possible all these same uses can be used on dogs? For example, will it help balance the urine pH in canines also? Hi Chaser. I’m not sure about the use in pets, but I’ll do some research and find out. It would be good to know if it might help cats with urine pH problems too. I’ll get back to you on that. I have used liquid Yarrow for over 8 years for a rectal bleed that was causing me to get blood transfusions every 8 to 10 weeks.Since my naturopath started me on this with a few other things i have not had a single transfusion. Thanks William! I knew it worked for many things, but this is the first I’ve heard of it working like that. Good for you!! I hope others can benefit as well. When you say that yarrow can be used for all these things, do you mean the leaves, flowers, or roots, or the whole plant? We have lots of yarrow growing here, and while I enjoy the sunny yellow flowers, I’d love to be able to use it for tea. All of the parts of the yarrow plant can be used, Chris, but the ariel parts, the flowers and leaves, have the most active ingredients in them.